2008 December « GASTHAUS: got 'kraut? See you next year, starting Friday, January 2, 2008. WOW! Almost hard to believe it’s already been 15 years of Gasthaus Gemütlichkeit. What a great ride it’s been. We would like to thank all of our loyal customers and hope to continue serving you for many years in the future. After months of renovating the space that was formerly Gingerbread children’s clothing store, we opened the doors on December 18, 1993. Fortunately, Gingerbread’s store already had the little houses built, we removed the two in the back to make room for a kitchen and the restrooms. Our very first customer was Ingeborg Chandler, below, a native of Germany. Back then we still had a deli and she bought some German sausage. I still remember how surprised she was to see a German restaurant in the area. Michael Greipel hands Ingeborg Chandler, our first customer, her items. We started serving lunch and dinner at first. After a while that proved to be too exhausting for a small family business as ours and we decided to concentrate all our efforts on dinner time only. This way we can perfect our service, food and ambiance to you, our customer. Over the years we’ve seen customers bring their young children to dinner. Children who have now grown into young adults. As you can see below one of our own, Molly, Annemarie and Michael’s first grand-child, was just a little baby when we first opened. She was born in 1995. Baby Molly always in the middle of the action, sitting on Annemarie's lap. Annemarie and Molly bake a cake together. Also, we would also like to thank the wonderful staff, ESPECIALLY our kitchen staff: Jean-Phillipe and Jason. You guys ROCK!!! We’re a team and without them we couldn’t do it all. Thanks guys! We will be closing from December 23 – January 1, 2009. Sorry for any inconvenience caused. We wish you a safe and peaceful holiday season and hope to see you again after January 2, 2009. This week’s special are Nürnberger Bratwürste served with Sauerkraut and Pan-Fried Potatoes. Our soup is the ever so popular Sauerkraut soup with smoked pork and potatoes and we also have a special Chef Salad – a Wilted Spinach Salad with a warm bacon, potato dressing garnished with cherry tomatoes and pine nuts. Mmmmh! The WAVE3 LIVE show was a success!! 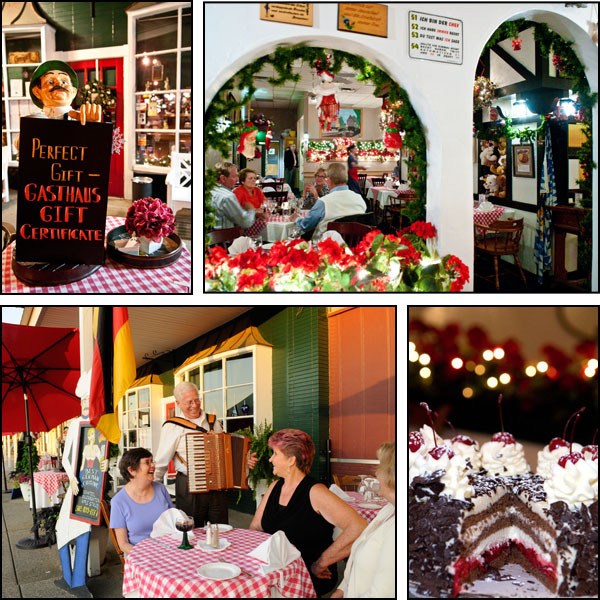 Cindi and her crew showed a nice slice of what the Gasthaus is all about: great food and a warm atmosphere. Joining us for this special event were family and loyal customers who have become friends of our family. 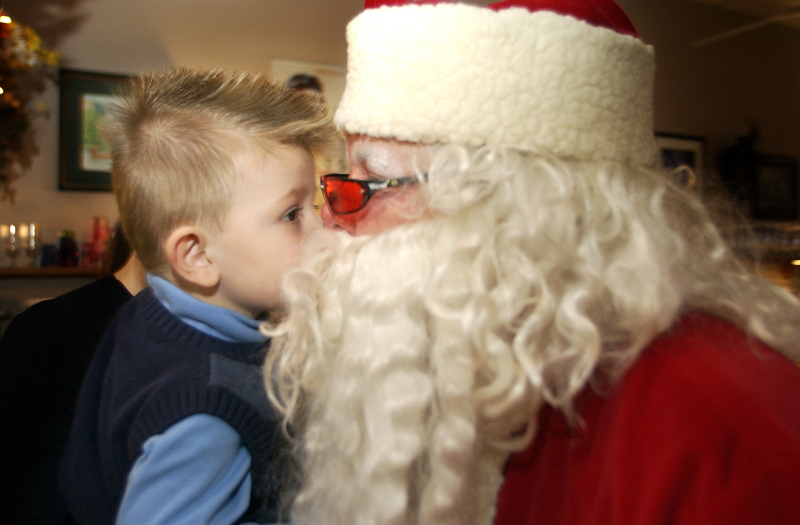 Even Santa paid us a visit, handing out gifts to the guests. There was only one problem. Annemarie’s presentation of the making of Feuerzangenbowle , a drink, didn’t quite light up like she was expecting. The presentation requires rum with a high alcohol content to be ignited as it soaks in a cone of sugar. Unfortunately, Nina handed Annemarie the wrong rum right before the show came back from commercials. This mistake prevented the flame from shooting up in a dramatic display. Although that was probably best since it might have been dangerous. Later that evening a customer, who had seen the show, brought us a bottle of Bacardi 151, the same rum we had bought and mistakenly not used. Thanks WAVE 3 for coming! 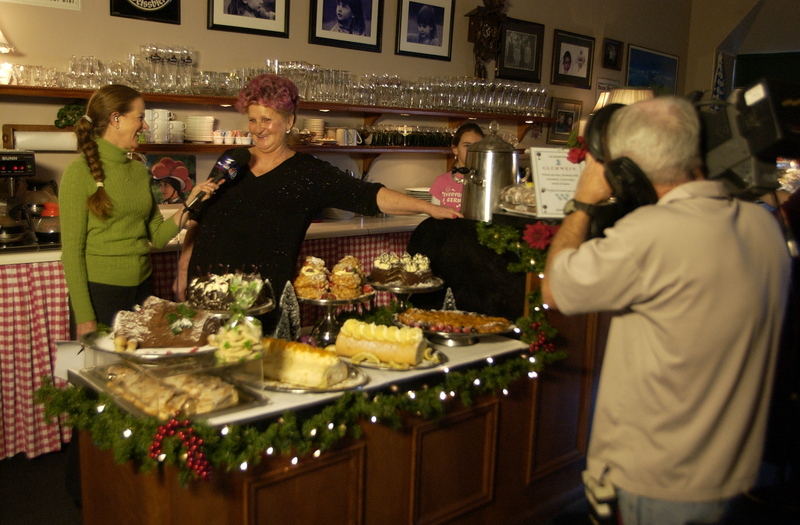 Cindi Sullivan interviews Annemarie, the owner, about her delicious desserts. 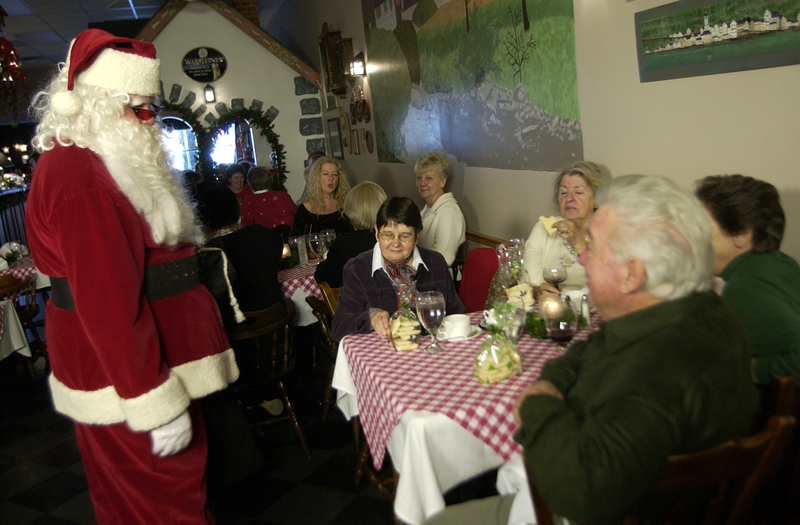 It’s that time of year again: WAVE 3 Listens will broadcast their show LIVE from the Gasthaus from 10-11 am this Friday, December 5, 2008 !!! Cindi Sullivan and WAVE3 videographers will be filming at the restaurant while we serve delicious Filet Gulash with Spaetzle and Red Cabbage to our guests. Viewers may call in the show for questions and/ or comments at 571-5263 or 1-888-800-9283. We are already booked for this special event, but you may come by the restaurant for take-out for $10.